The factory-trained technicians at WD Services, Inc. are dedicated to providing quality workmanship in a timely manner. We realize the importance of solving your equipment issues and getting it running correctly. That’s why WD Services, Inc. technicians always arrive with the preparation and necessary equipment required to service your equipment, getting it back to optimal operating condition in a timely manner. As well, our knowledgeable technicians and staff are committed to fulfilling your replacement part requests. Our warehouse is fully stocked with parts that will be shipped to you in a timely manner getting you back in business servicing your customers. WD Services, Inc. offers repair service for your spray paint booth, prep station and mix room. Our qualified technicians are equipped to repair all of the spray paint booth equipment in your business saving you the task of finding other repair companies. Every now and then your equipment may not perform at its optimal level. Rest easy knowing that WD Services, Inc.’s qualified service technicians will come to your location and get your equipment back in working order quickly. In most cases, we are able to diagnose the issues and repair the problem on the first visit. A large warehouse ensures that WD Services, Inc. has the parts that you need to repair your equipment when you need them. Just call or email your parts inquiry and we will promptly forward you a quote. Stock parts are normally shipped the same day your approved quote is received. 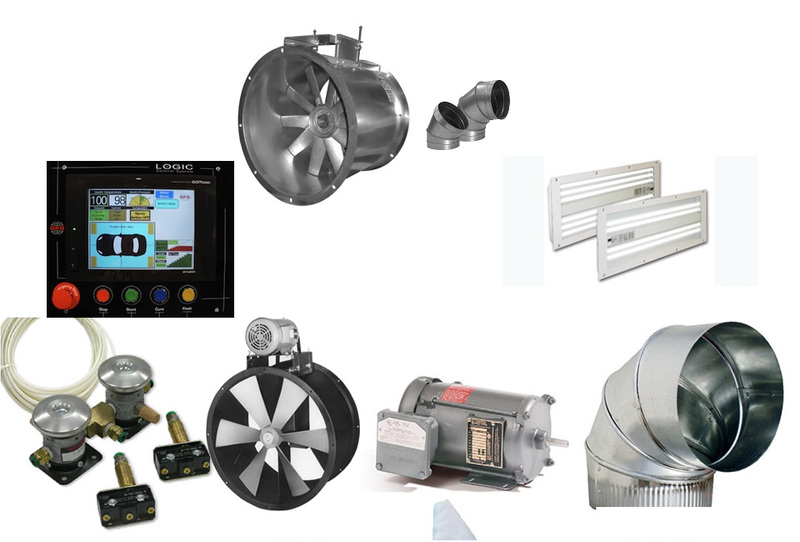 In the event the part has to be ordered from our supplier, the part will usually be shipped the same day it is received by WD Services, Inc.
For preventive maintenance we offer a quality 25-point tune up on CWN, Accudraft, Blowtherm, Binks, DeVilbiss, Global Finishing Solutions Booths and other equipment. The tune up includes services such as checking the burner and motor belts as-well-as measuring the air flow. This tune up will keep your equipment functioning properly within original factory recommended specifications while increasing the productivity and life of your investment. We understand that your staff is busy at their tasks of completing customer projects. That is why WD Services, Inc. offers a filter replacement service. Our technicians will come in to your location with clean filters to replace your dirty, existing filters in your spray paint booth equipment. After all, clean filters will enable your spray paint booth equipment to last longer and perform at its best.